I can smell Cornwall before I can see it. Driving across the ancient border between Devon and Cornwall at night it’s pitch black, but I know that if I wind the car window down the mingled scent of damp heather, moss, fern and lichen will be forced up my nostrils faster than I can say ‘Kernow a’gas dynergh‘: ‘Welcome to Cornwall‘, in Cornish. I’m staying with my sister Kat and my niece Martha whilst I recover from a month of ill-health and general mayhem, and before I embark on my annual trip to India and China. They say a change is as good as a rest, which is just as well: a change it is, a rest it is not. 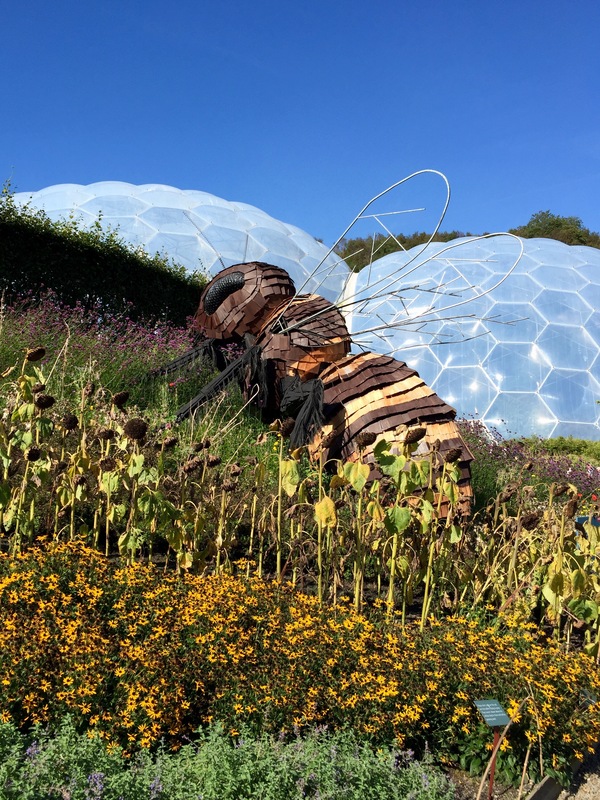 We visited the Eden Project today. Martha proudly announced that I would love it, oblivious of the fact that I’ve been having an affair with this amazing enterprise for 17 years, witnessing the transformation from clay pit to class act. Eden never disappoints. Its long, winding paths were mercifully quiet today, bathed in soft autumn light and baking hot, which would have suited most of the plants more than it suited me. The way Eden has settled into its landscape is breathtaking. 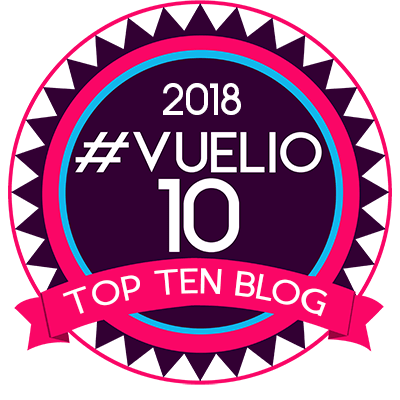 It’s almost impossible to imagine how the site was twenty years ago – a bleached-out, slurry-filled hell-hole with a bleak future. Now Bodelva’s steep cliffs are thick with native greenery and the pit is filled with an encyclopedic collection of plants that have benefitted man in one way or another. I was looking forward to seeing the National Collection of Kniphofia in flower, but it was all over bar a few chunky Kniphofia rooperi. Thank goodness for generous clumps of Hesperantha coccinea which splattered the grassy banks with red. 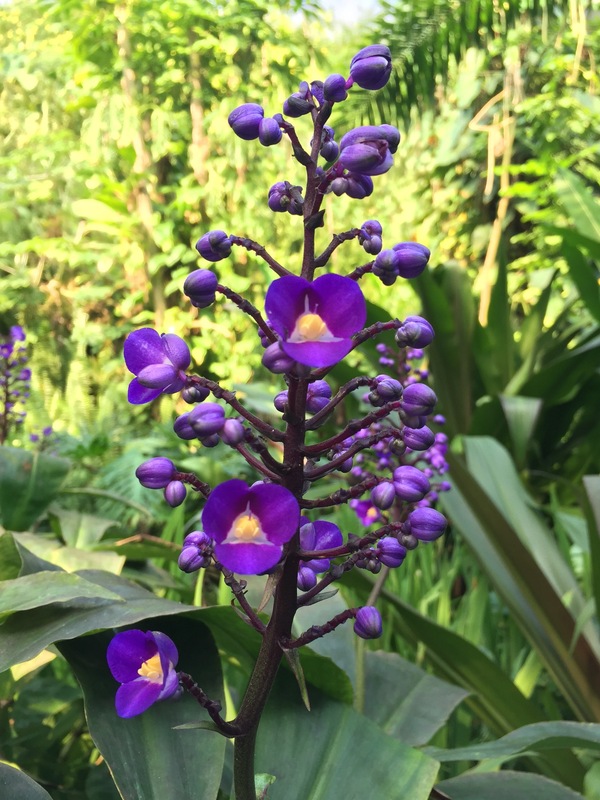 The humid tropical biome was a joy to behold as always, jam-packed with jaw-droppingly beautiful plants, including the blue ginger, Dichorisandra thryrisflora, which is not actually a ginger at all, but who cares. I tried to make a video of the cascade that runs through the vegetation. This went well until Martha decided she wanted my attention and starting yanking at my camera bag. 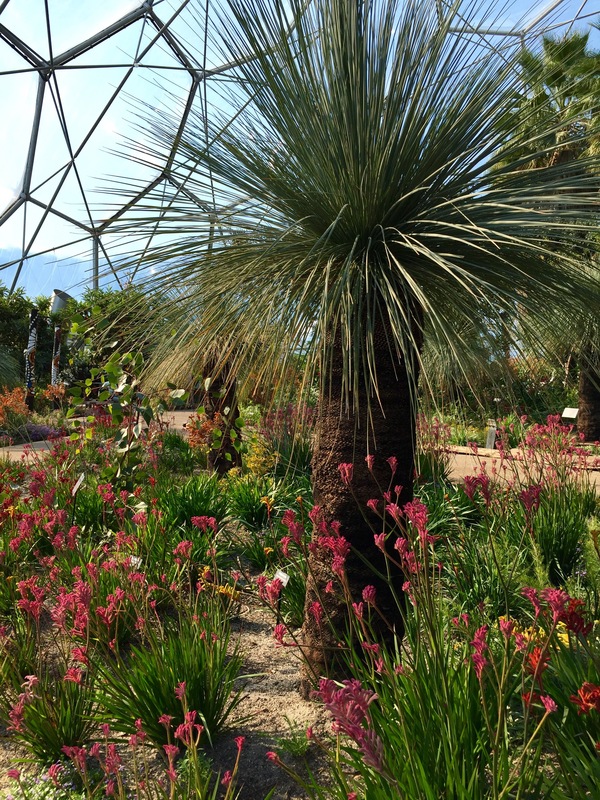 I’m frankly hopeless in hot, humid, conditions – I melt faster than a tub of Kelly’s clotted cream ice cream – so I’m always relieved to escape to the Mediterranean biome. I could move in here at the drop of a hat to write joyfully among the vines and olive trees that have established themselves so impressively. Here there are colonies of Geranium maderense and Sparmannia africana so handsome they make me weep. Impressive collections of chilli, tomato and aubergine kept Martha amused for at least ten minutes. 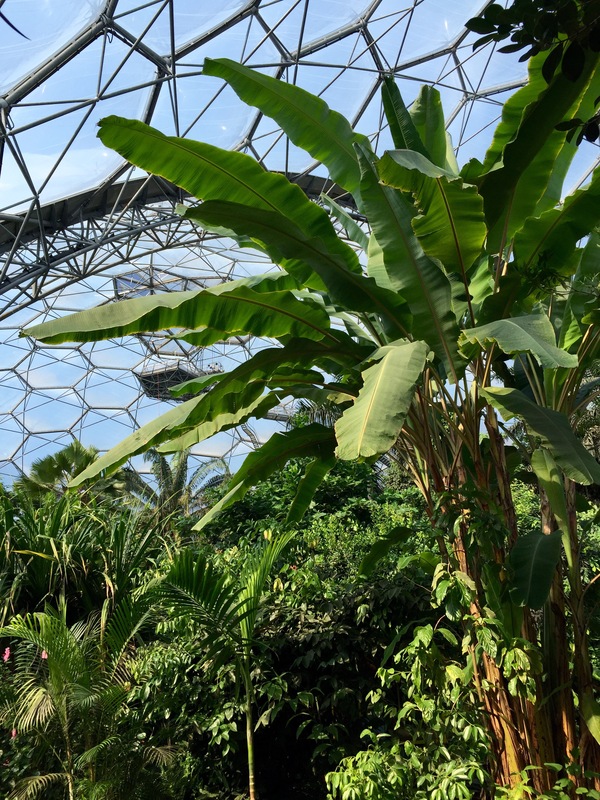 With a three-and-a-half-year-old in tow a visit to Eden is never going to be relaxing, but this experience does throw the project’s broad appeal into perspective. Young and old, first-timers and old-timers, thrill-seekers and land-lubbers alike, everyone was in awe and enjoying a great day out. This is not an easy feat for an attraction in the 21st Century and testament to Eden’s energy and our eternal fascination with the natural world. TFG. Sadly the China I see is not worth taking photographs of. It is getting better, but work tends to get in the way. I will see what I can do! I’ll be there, although the summit is only 10 minutes from my sister’s house so it always feels like I’m cheating! P.S. I walked up there in the driving rain yesterday and got completely soaked through. The fire-damaged heathland is already turning green. It’s incredible how quickly nature regenerates. It must mean the fire did not burn too fiercely. I love living in a Mediterranean climate! We can grow more than most, even that ‘grass tree’ and palms, without the help of a dome. However, the lack of wintry weather can get boring. Only if you live in the Mediterranean! I love the changing of the seasons but I could live without winter. It is a Mediterranean climate here near San Jose, and even milder where I write in Beverly Hills (near Los Angeles, more than 350 miles away). I never experienced a ‘real’ winter. I though I would when I went to Oklahoma at the end of 2012, but we left before ‘real’ winter started. The house we stayed in was damaged the following spring by a tornado, the day before and just a few miles from the Moore Tornado. I too saw Eden when it was a hole in the ground, they’d opened a basic visitor centre but nothing else. Tractor tours around a muddy site and barely believable pictures of what they intended was what was on offer. Truly, it is an impressive feat and testament to what one person can make happen given sufficient drive and vision. Haven’t been for about 10 years, must make a trip. You certainly must. Eden just gets better and better. The tractor tour is still available – we did it today and part of the route is still the same. Yes, feeling better. I have an unshakeable cough and am deaf in one ear still. I fully expect both afflictions will come with me to India. You’ll need to shout at me and try not to be irritated by the cough! I love the blue ginger. I’m imagining an exotic scent wafting over across the pond to me! I stuck my nose in but there was no scent. As Dichorisandra thryrisflora is more closely related to tradescantias than gingers it’s perhaps no surprise that the flowers are not fragrant. I guess no plant has it all? Thank you Dan. Such a treat to see up-to-date photos of Eden. I have had a whole day there with my husband maybe 7 years ago and it was all that we’d hoped for and more. 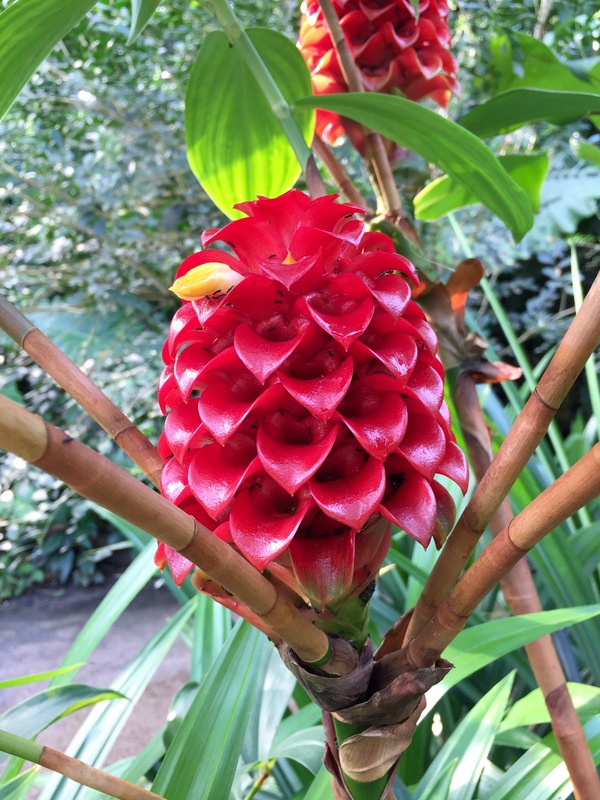 Those ginger flowers are astonishing – I love their form and colour! I recommend a return visit if you can make it. So much has changed. 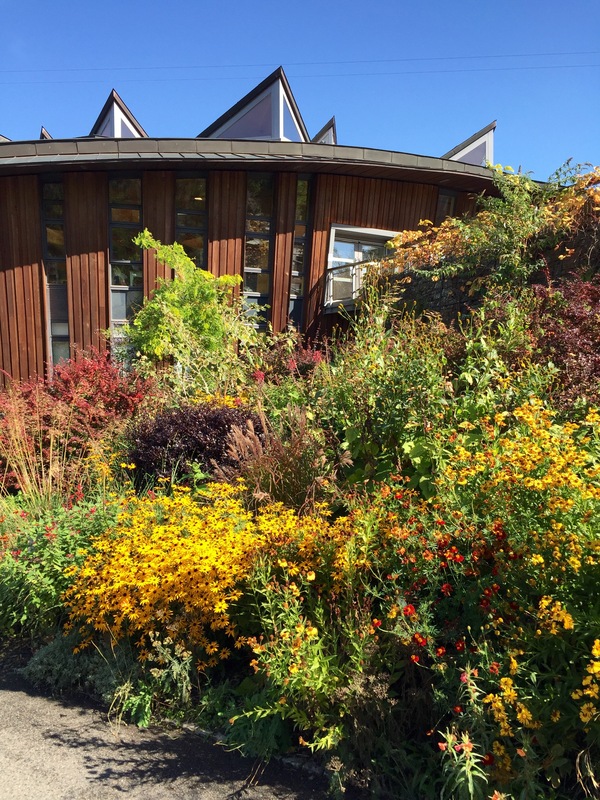 It all felt very contrived at the start, but the landscaping has settled down and the planting is much more diverse and interesting now. I still think the outdoor biome could be developed further – the temptation is to head straight for the covered biomes and only give the wider landscape a passing glance. There’s no better place for R&R than the South West, lovely fresh air from off the Atlantic, and a complete change from living in a city. We love the Eden Project but our favourite, with or without our neighbour’s little black dog, is Heligan, at any time of year. Our Geranium maderense has flowered its socks off and will be overwintering in the greenhouse. Lovely weather down here for a couple of days, hope you fully recuperate before your hectic schedule starts again. Thanks. We’re off to Heligan this morning as it happens. Making the most of the weather before the rain arrives tomorrow. Geranium maderense usually dies after it has flowered. Have you struck it lucky, or perhaps you have Geranium palmatum which is similar? This one can go on for years and years. The way you can tell is that maderense flowers like an atomic bomb going off, palmatum creates a cartwheel of flower stems radiating from the centre of the plant. I’m so glad to be down here. I am sure I won’t want to go back! I LOVED seeing these! 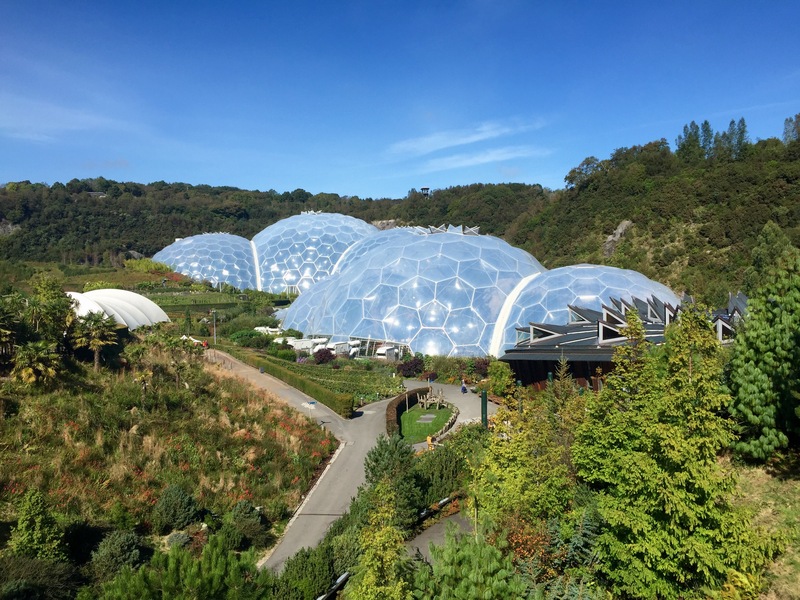 I was able to visit the Eden Project last May with a garden tour group (from the Pacific Northwest in the U.S.). I recognize some of those spots but like your pictures better than mine (and don’t need to break a sweat to see the views!). I’ve wondered often what your camera preference is (not that a camera is the sole reason for nice shots). Your photographs are always beautiful. Yes, you should go again. It is VERY expensive now (adult £27.50), but you can turn that into an annual pass for no extra charge. Still a lot if you can only visit once and then want to buy lunch and a few gifts ….. which I always do. The trick is to go in winter, when it’s cheaper to get in, and you can still get your entrance turned into an annual pass. 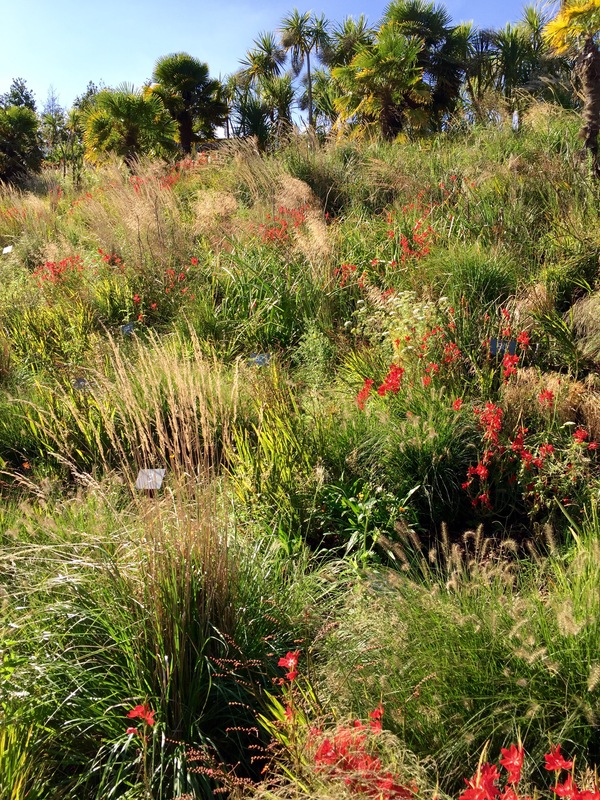 Hesperantha coccinea is what I need for the Precipitous Bank… exactly!! Have a good day. Heligan is on my list. Next year or bust. It’s everywhere here – along with Belladonna amaryllis. If the flowers were not so lovely I ought to be bored of seeing them by now! I visited the Eden Project in 2010 with my sister. I enjoyed every second especially the tropical biome with the waterfall. It was a great day in great holidays in Cornwall! Since then they have built a lot of aerial walkways and bridges which are fun, if you don’t mind heights. When the sun is out the temperatures are sometimes in the mid forties meaning they have to close these aerial routes. Cleverly there is now a ‘chill out’ room at the top where you can go to cool down. The waterfall also creates a wonderfully cooling breeze. I hope you get to make a return visit soon. Looked up common ginger, and the flower is similar. That orchidy look like on Catalpa trees. You have that tree in the UK? It’s one of my favorites. Catalpa Speciosa.